More than 50 years ago, Bob McKamey opened Capital Toyota here in Chattanooga. In 1966, when this dealership opened, it was the very first Toyota dealership in the state of Tennessee and is still the only Toyota dealership in Chattanooga. Capital Toyota quickly began to grow under the business skills of McKamey and it became the first Toyota dealership within the 14 mid-America states to sell 100 Toyota vehicles in one month. McKamey was also the first Toyota dealer to sell a fleet of 100 Toyota trucks to the United States government. It didn’t take long for McKamey to show off his leadership potential, and he became the founding director of the Toyota Dealer Advertising Board (TDA). He served as its president for 26 years. He also formed the local Cincinnati TDA—the oldest in the country. Today it has a budget of more than $70 million. McKamey has also held leadership roles and has been active in the Toyota National Council, the Cincinnati Regional Dealer Advisory Board, the Toyota Dealer Council, the American International Automobile Dealers Association (AIADA), and the Chattanooga Automobile Dealers Association. As his career progressed, McKamey recognized the importance of political action, and in 1991 he was one of the founding directors of the Americans for Free International Trade Political Action Group (AFIT-PAC). He later served as a representative for Toyota and AIADA on three trade missions to Japan to help with free trade negotiations. He also played a critical role in preventing the passage of a tax that would have effectively doubled the cost of all imported vehicles. One of McKamey most significant accomplishments was being a lead voice in pushing Toyota towards developing the Toyota Finance Company, now known as Toyota Motor Credit Company (TMCC). Today, TMCC is a major asset that is used by both Toyota and Lexus dealers. As a gift for the city of Chattanooga, the McKamey family organized the McKamey Pet and Adoption Center, which is one of the most highly ranked centers of its kind in the country. Even after 50 years in the business, Bob McKamey shows no signs of quitting. He recently completed renovations on Capital Toyota and will start the renovation process in 2017 on Lexus of Chattanooga. Here at Capital Toyota, we could not be more proud of our heritage and the strong leader we have at our head. First Toyota dealer in Tennessee and still Chattanooga’s ONLY Toyota Dealer. First Toyota dealer in 14 Mid-America states to sell 100 Toyota vehicles in one month. 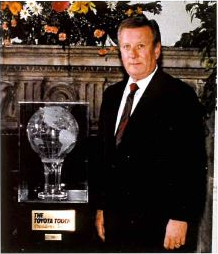 He was a founding director of the Toyota Dealer Advertising Board, and he served as its president for 26 years. First Toyota dealer to represent the 14 Mid-America states on the Toyota National Council. First Toyota dealer to represent Toyota on the Board of Directors of the American International Automobile Dealers Association (AIADA). First dealer to represent either a Japanese or Asiatic manufacturer on the board of AIADA. He was instrumental in initiating and structuring the Cincinnati TDA, the oldest in the country, and the one that has served as a model for all other TDAs. Today the Cincinnati TDA has a combined budget of more than $10 million. He served on the Cincinnati Regional Dealer Advisory Board for 26 years, and he served as the Chairman for nine, two-year terms. He served as a Toyota Director on the Board of AIADA longer than any dealer in history. He served as Chairman for two years for this valuable organization that represents all import makes in the entire United States. He has been very active on the Toyota Dealer Council, serving in leadership roles longer than any other dealer. Bob holds the distinction of being the only Toyota dealer who has served as the National Chairman of this organization for four terms. He was an active member of the Chattanooga Automobile Dealers Association and the Tennessee Automobile Dealers Association. In 1985, Bob partnered with Steve Gates in Kentucky and Indiana Automobile Franchises.